Today we are excited to introduce another beautiful hand lettering set by Paola with Merry Christmas Wishes! This is a great addition to our collection with Thank You Wishes, Birthday Wishes and Hello Friend Wishes. We may or may not have one more set up our sleeves this month! 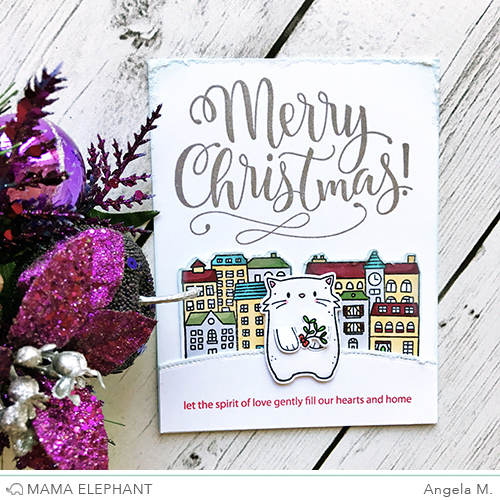 I paired this gorgeous sentiment with a city scene by using the cluster of buildings in City Sidewalks and the kitty from Page Huggers. Then I mixed some modge podge with some clear glitter and scraped the mixture on the edges to make it look like snow! We hope you will love this set as much as we do! Love the script but hope that one sentiment is a typo. It should say may you have the gift of faith. Not "gift the of faith"
Absolutely gorgeous font! Love the sweet sentiments in this set! BEAUTIFUL Font.I love the sentiments. The sentiments are great! My fave! Love the large size, and swirly font! Love the font! I love different kinds of writing and I am so sad that schools don't teach it anymore. I love to write in cursive but I tend to forget that my nephew didn't learn cursive in school (he's 18) so if you can't do it, you can't read it. I love all the other sentiments too. I may have to get this one! I always love your scripty dtamps!!! Beautiful set!!! I can't wait to use it on my Christmas cards. This is lovely - really original additions to the beautiful script. The article is well written and to the point. Can't wait until November 29? Set up an alert for Black Friday 2019 deals and we'll let you know whenever we find a deal that meets or beats Black Friday prices. Don't forget to also keep your eye on our Cyber Monday deals while you're browsing.